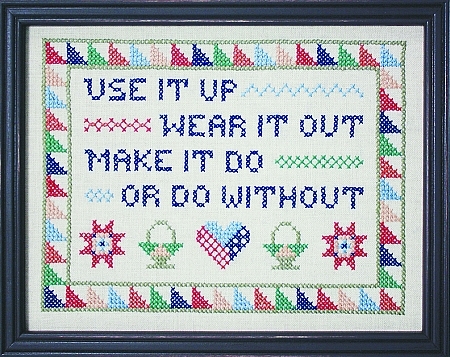 This Beginner cross stitch stamped sampler combines a famous saying that helped early Americans realize their true values and set into motion a principle that is still understood today.This idea is the heart of our modern Quilters and why America has such glorious Quilts today.This larger stitch cross stitch sampler has several quilting motifs,along with a quilted border to highlight and support this famous saying.It is sewn on natural linen. This is a wonderful and simple project. I absolutely love it! Great quality. Everything I've ordered from you is just terrific! I love the larger size stamping-great for beginners and for teaching pre-teen stitchers. I can't wait to start my next one!